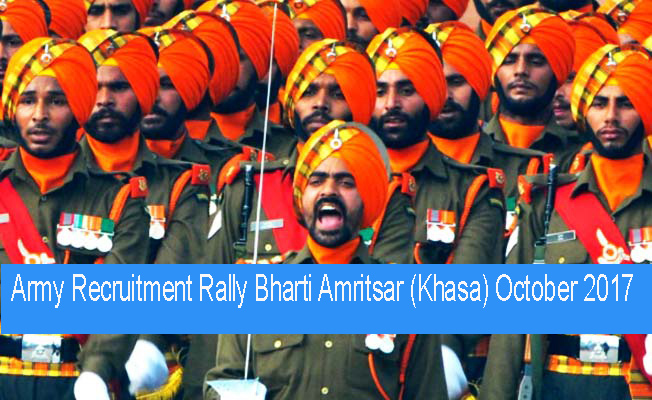 An army recruitment rally will be held for the candidates of District of Amritsar, Taran Taran, Gurdaspur and Pathankot from 04 October 2017 to 17 October 2017 at Khasa Military Cantt at CP-8. Detailedday wise Rally Schedule will be finalized on 20 September 2017 and the day of Run will be intimated to the respective candidates by e-mail to their registered e-mail IDs. Candidates shall take printout of "Admit Card" and bring along with all relevant documents to the Rally Ground. In Case any Candidates wishes to aimed is category or any particulars given in Online regn then "Admit Card" will be brought to ARO Amritsar for suitable amendments wef 21 September 2017 to 28 September 2017. (ii) Height : Minimum 170 CmS. (iii) Weight : 50 kgs. (iv) Chest : Min 77cm and expansion of at least 05 cms. (v) Education : Matric (10th) pass with 45% marks in aggregats and 33% in each subject or 10+2 pass. and Maths/Accts/Book Keeping in CIX or CXII. Should have secured min 50% in each of these subjects, whether it was studied in CIX or CXII. If a candidate is graduate but not having English & Maths/Accts/Book Keeping, he should have more than 50% in English and Maths/Accts/Book in CIX or CXI. (Vocational stream is not applicable). (iv) Chest : Min 77cm and expansion of atlesast 05 cms. (v) Education : 10+2, exam pass in Science with English, Maths, Physics and chemistry with min 50% marks in aggregate and 40% marks in each subject OR Three Years Diploma in Engg Mechanical/Electrical / Automobiles / Computer Science and Electronic & Instrumentation Engg) from a recognized Polytechnic Instts ITI (No edin relaxation for this cat is existing presently) 4. Candidate should bring 12 copies of latest passport size photographs. (Sikh candidate should bring 12 copies with turban and 12 copies without turban). (i) NCC Certificate (A/B/C) (ii) ITI/Polytechnic/Computer Course and Typing Course. (iii) Participation in Sports at international/National/State level with 1st and 2nd position in the discipline within last two years. (g) No claim certificate duly countersigned by Village Sarpanch with photo & the candidates who are below 18 years will bring no claim certificate duly signed by parents. No claim for any injury or loss sustained during the rally will be entertained. 5. Correct E-mail ID and Mobile Number will be mentioned during registration and should not be changed till the Candidate is despatched to regimental centre. OFFICER/CHIEF RECORD OFFICER ONLY. Certificate with over-writing tampering of seal or erasing of any type will not be accepted. 3. Vocational stream of 10+2 is not yet recognized as equivalent of intermediates. 4. All candidates are requested to wear running shoes to avoid injuries to the foot proper running dress will worn by all candidates. 5. 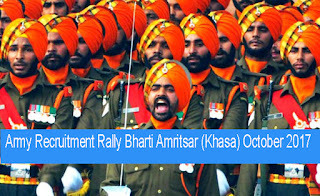 Candidate not in possession of the requisite documents will be debarred from recruitment rally. lead to cancellation to the candidature any stage. 7. A grievance cell will be established at the rally site and any queries will be addressed by the staff at grievance cell. etc. In case of caste certificate where caste do not include the word 'SIKH' a separate religion certificate issued by SDM and Tehsildar is necessary. 10. All Candidates are liable to be screened for use of physical performance enhancing drugs the recruitment rally. 11. Negative marking would be applied in the Common Entrance Examination (Written Test) for all categories. 12. Candidates below the age of 21 years at the time of screening must be unmarried. 13. No mobile will be permitted in the rally ground due to security reasons. 14. Aadhar is mandatory for registration for the rally. 15. RECRUITING ISAFREE SERVICE. EVERY CANDIDATE WILL BE GIVENAFAIR CHANCE AND NO MONEYS CHARGED FROMANYONE 16. GATES FORINTAKE OF CANDIDATES AT THERALLY SITE WILLCLOSEBY O8.OOHRS. 17 NO CLAM FOR ANY INJURY OR LOSS SUSTAINED DURING THERALLY WILL BE ENTERTAINED BY THE INDIAN ARMY. 18 ALL CANDDATS SHOULD PRODUCEDAADHAR CARD 8. PAN CARD DURING DESPATCH TO TRAINING CENTRE.